Most of my clients are restaurants. I’m speaking primarily to restaurants, even large restaurant groups…I’m talking 20-100 locations. Not Chipotle or Starbucks – I think that gets into another realm. But at the arbitrarily chosen ’100′ unit level or below, there’s plenty of room to talk with candor and humor, insight and personality as to what is going on behind the scenes. Pick a menu item. Just one. Riff on it. Say what comes to mind. ”I uh, I gotta admit, this is not my favorite menu item. Ok, fine, I hate it. My mother told me to put it on here – it was her favorite thing to make as a kid and I felt an obligation to include it, but…” Maybe this isn’t the best example. But pick a menu item and be honest – “You know, this isn’t the most popular item on the menu, but I love it, and here’s why” Or talk about how you came up with the name of your restaurant. ”There’s not a lot to it Jamie, there’s just not…pretty boring story!” Well say that! Exactly that. Just write. There’s a lot of story there. Just write about it. You never know what might come of it. Who knows? One month you have 4838 impression and 831 actions, and a few months later, for the same “data set” ie. time frame, it gets a little moody and decides…nah, it’s now 9843 impressions, 983 actions. This is, of course, for the backend of Google Places / + / Local whuchyama’callit – Google’s version of “Local”. Confusing on many levels, but in terms of pure analytical data, I have seen time and again after notating numbers on spreadsheets for clients that read something like this: Client #1. February 19-March 18, 2013: 4291 impressions, 579 actions. Ok! We’re in the game. I guess that’s what’s posted, that’s what’s going on! Ok. Now…let’s pretend 3 months passes. Ok. So, now, here we sit three months later and woila, we log back in, and go huh, I wonder what my numbers are for that same period I checked 3 months ago: Feb 19- March 18 2013? Let’s check. I’m not going to give EXACT numbers, but in this case it was 42.82999% HIGHER than it was 3 months PREVIOUS for the same time period. If you’re confused, OR…if you think we’re in the Twilight Zone, yes, you’re right. Or, more appropriately, no, you’re fine, but Google seems to be confused! Again, I don’t know what’s going on here. But, the trend over the last 24 months or so is that these numbers, when referred to IN THE FUTURE seem to trend HIGHER, not lower. Very curious indeed. Here’s how I feel about it: I don’t trust any of it. It seems TOTALLY random. I give these numbers to clients, but I have to say: it’s not entirely ‘stable’ data. It’s going up..great! I’m happy for that, but it’s not…it doesn’t seem to…I don’t know. Doesn’t seem flush. The almighty Google. What is going on? It amazes me how difficult it is to get my clients to make updates to their website at all, let alone on a continual basis. There’s the whole rigamarole with website access and “webmaster’s” off in India or Cambodia for their yearly 6 month soujourns, or web dev guys just deciding not to get back to you, or…lost id and passwords and millions upon millions of sites floating out there “in” the internet like space junk. But even when they have access, clients i.e small businesses are just unable, unwilling or not wanting to “get” why it’s important to update content on their website on a regular basis. Beyond that, even if they do “understand” or nod their head, they’re still unwilling. NOT ALL! Not all. Some do. And those that do, or those that let me do, rank better. I’m going to go crazy now updating my clients websites over the next few months – those clients that let me update their sites, either through proxy via their ‘webmaster’ or directly. Either way, I guarantee…I call as Babe Ruth did in whatever World Series he pointed his bat out to left field and hit a home run – I analogously call a home run here IN COMPARISON to those guys that, with all things equal i.e. link building, profile management, social, etc, that those that update their sites CONSISTENTLY with great content will “wash away” those that don’t. 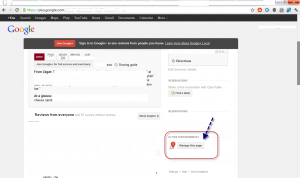 Just checking this morning (Friday, May 3, 2013) and Google no longer has “Places” as a drop down option in the top black navigation at the tippy top of the page under “More”, nor do they have it in the “More” navigation drop down under the search bar. Wow. So, yesterday you could search under “Places”…now you no longer can. 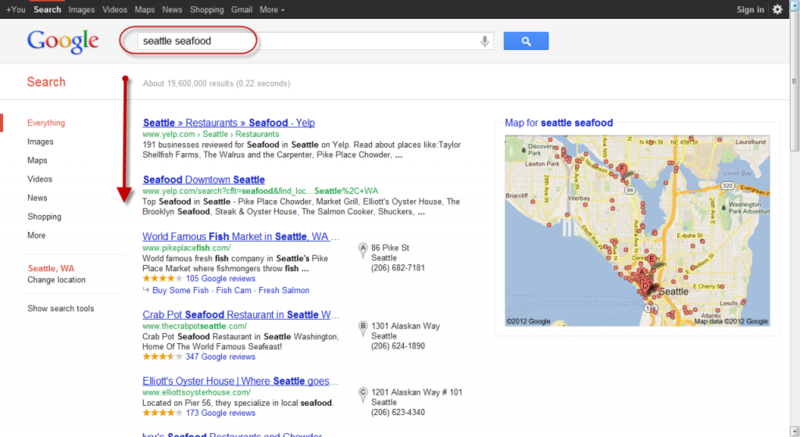 You can now only search local results, like “Seafood Seattle”, under Maps. You’ll GET limited local results served to you under general search, but there’s no clear way to select “more local results” – you’re only able to go to ensuing search pages (i.e page 2, page 3, page 4) which has blended organic, local and other search results. Hmmmm. Weird. Google’s local search deal still appears to be a boondoggle. This indicates to my clients and to me that in fact the page is not already claimed or being managed. Annoying. When you log in to your account, which in itself is a bit of a maze to figure out (log in, search Google for “Google local” and basically finagle your way through the back door) you’ll see that in fact after you get to the page and you click “manage this page” that it takes you directly to your local business center where your listing is in fact being shown as a well managed and very claimed business listing! It seems things are getting more complicated and more weird over at Google than they were in years past. In years past, if your page was claimed, it indicated that in fact “this business page has been claimed” or some such language. It was evident to anyone seeing the page that it was claimed. If it wasn’t claimed, that was indicated by a mention consistent with the above stating: ”Own this business? manage this page”. Fed Ex has a response from their Senior VP of US Operations. His response has 306 views as of 12/21/2011 at 5:41pm PST. The video of the man throwing the TV / Flatscreen over the fence has millions! My point? Authenticity. Being candid. The response is great in so far that they posted something immediately, on YouTube, but it still is lame, very lame. One, it should be from the CEO. Two, seeing a Fed Ex employee roughly dressed – unlike their UPS competitors – throwing valuables over a fence doesn’t ‘shock’ me. This will most likely hurt Fed Ex in the short and medium run. The only thing that would have really sanitized this situation would have been a candid, non-scripted message direct from their CEO. This video is way too scripted, way to ‘corporate’ filled with generalities and non-measurable conclusions. Businesses can get ahead of the ‘user review’ curve being candid, frank, factual, heart felt and non-scripted with video responses to their customer raves and complaints online. This includes Yelp reviews, Citysearch, Trip Advisor, Google, Yahoo, etc. It goes a long way to show the quality of the people behind the business, and that makes a big difference.